We have already introduced MEVU, the decentralized betting app on the Ethereum blockchain well on its way to shaking up the online sportsbook and casino industry. Now we aim to take a closer look at just what makes MEVU unique, its token sale, and how the betting industry stands to explode in value in the upcoming years. The online sports betting market has been estimated to be worth at least US$1 trillion, and in light of the blockchain revolution, there are plenty of projects racing to build online casinos powered by cryptocurrency. But where MEVU stands out from the rest is that bettors using their platform aren’t handing over their cash (or rather, ETH, since currently all MEVU bets are placed in Ethereum) to a bookie or betting against the house. MEVU’s betting system is peer-to-peer (P2P), which means you can compete directly against your friends. Bettors decide the terms and conditions of the bet, they enter wagered funds directly into an escrow rather than to a third party, and even disputes are mediated by a neutral, token-holding member of the MEVU community known as an Oracle. 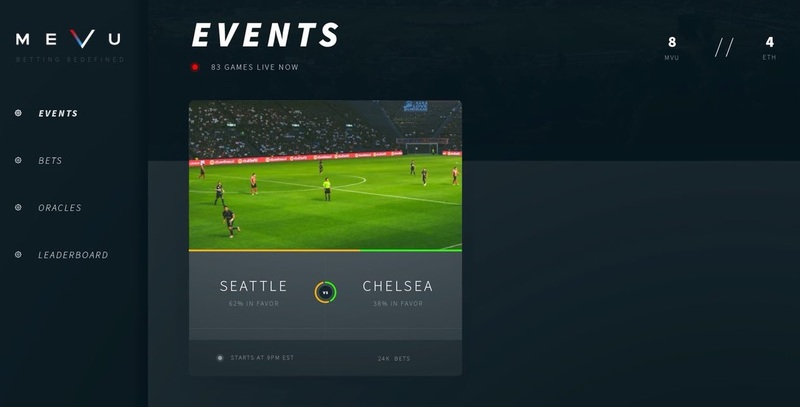 And while MEVU will focus mainly on sports and esports bets, it also offers individually tailored social bets – in which you and your buddies can place bets on, say, how soon a couple in your friend group will get engaged – and multi bets, in which a group of bettors can pool their wagers, and the winner(s) take all. What’s more, MEVU offers bettors low fees, or around 2% per bet won, to bet against each other. Plus, with bets being placed and stored permanently on the Ethereum blockchain, MEVU offers bettors the security, transparency, and fair play that tends to be missing in traditional casinos and sportsbooks. Ultimately, MEVU opens up online betting to a whole new dimension, turns it into an interactive, social activity, and keeps your funds and personal data safe while doing so. MEVU’s local ERC-20 cryptocurrency is the MVU token, of which there is a maximum of 104,800,000. In order to raise funds for their project, MEVU is holding both a private and public initial token offering (ITO). The private presale is currently open, and will run until July 16, or until it hits a hard cap of 15 million tokens. Funds raised will go towards development of the platform in preparation for their mainnet launch, legal costs, and marketing for the upcoming public ITO. 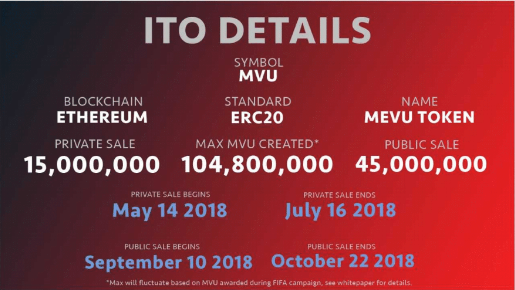 MEVU’s public token sale will kick off on September 10, and continue until October 22. 1 MVU will be available at a discounted rate of US$0.34 from September 10 to 19. After that, the price per MVU will increase by ½ cent each day, until it reaches its retail price of US$0.44. The public token sale will have a hard cap of 45 million MVU. 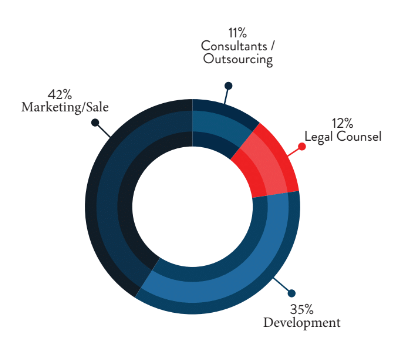 The majority of funds from the public token sale will then go toward marketing, development, testing, and auditing of the MEVU platform in preparation for their mainnet launch. 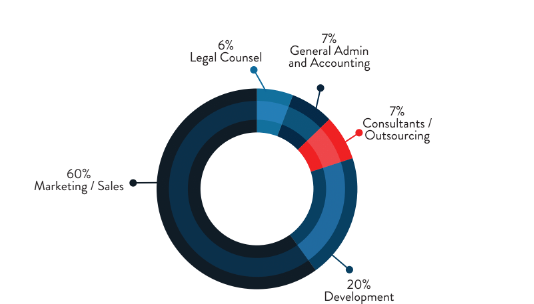 What is left over after that will go towards legal counsel, admin and accounting, and consultants. A sum of 44 million MVU will be withheld from the public ITO, to be used down the road as bounties and rewards among the community. With the scarcity created by withholding the MVU token, added to by token burning down the line, the MVU will then become a vital source of fuel to the MEVU ecosystem. Primarily, its use as a reward among oracles – who essentially work as referees to bets on the MEVU platform – serves as an incentive to remain objective and impartial when calling a victory. In case of a dispute over the result of a bet, a “jury” of oracles will stake a number of MVU tokens in order to reach a consensus on who the actual winner is. Dissenting oracles will have half of their staked tokens confiscated and given to the majority oracles, thus making it in everybody’s interest to report honestly on results. The amount of forfeited MVU tokens consensus-abiding oracles will be rewarded will be proportional to the number of MVU tokens they staked in the first place. Even in the case of rewards paid in ETH, they reap the benefits according to amount of MVU staked. And the use cases for the MVU token don’t end there – it will be used as referral rewards to both users who get friends to join the community and the friends who come onboard. Holders of MVU will get exclusive access to pooled sports bets and casino-style games at a discount. When you combine the facts that the MVU token is integral to the MEVU platform’s function, there will be strategic burning of tokens to create scarcity, and there will be steady demand for the tokens as new users join the platform, the MVU should appreciate in value over time. If you miss the ITO, don’t worry – there are still plenty of ways to obtain the MVU token. Mostly, you can receive them when you fulfill your duties as an oracle, but it’s also possible to receive them from transfers from other players, as rewards for referring and ranking other players, and as winnings from bets in exclusive games. It will also be possible to get your hands on a large amount of MVU this June, as MEVU will be offering its community the opportunity to bet on the FIFA World Cup 2018. US$140,000 worth of MVU will be up for grabs to let users predict the World Cup outcomes, and by competing against each other they’ll be able to make even more MVU in returns. There will be a leaderboard showing how many predictions bettors get correct, with their allocations to be paid out in MVU. MEVU developers predict there will be at least 30,000 users joining in the World Cup bets, so you’d best mark it on your calendar and join in while the tokens are hot! 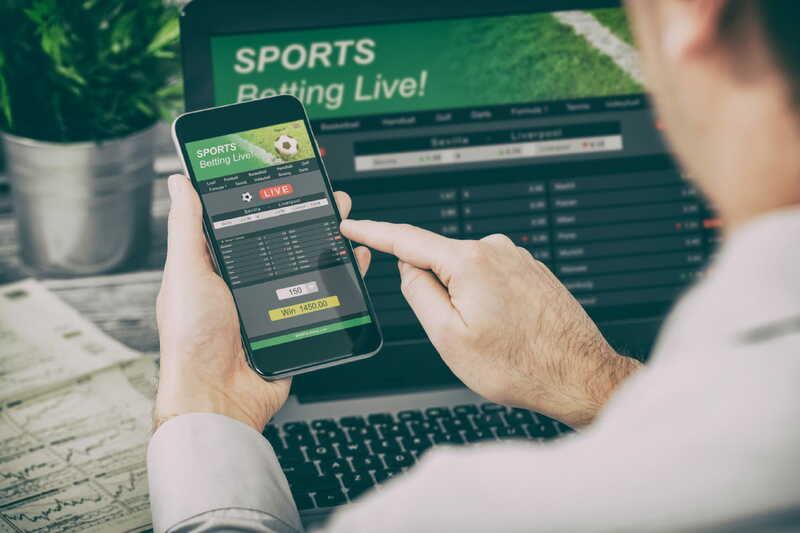 Even if you have no personal interest in betting, sports, or games, it can’t be denied that it’s a robust industry that has mushroomed in popularity since the introduction of internet and mobile devices. With blockchain and decentralized versions of online sportsbooks and casinos resulting in low fees, above-the-table transparency, and the capacity for individualized betting, the betting industry is set to take off in a big way. With a decrease in the stigma to gambling and an increase in accessibility, ESPN estimates that 118 million Americans make some sort of sports bet, placing a sum of up to US$380 billion every year. And this is only accounting for the United States – legal and illegal sports betting has been estimated to amount to $3 trillion worldwide, with a good 90% of that being illegal bets. Clearly, there is an enormous amount of monetary power to be harnessed in this industry. And with the US Supreme Court’s recent reversal of a law that hindered individual states from passing more lenient laws on sports betting, gambling startups are racing to seize the opportunity. Legalization of the gambling industry will lead to more ethical behavior from casinos and sportsbooks, which will benefit all parties involved. And it only stands to be reason that, with legalized betting options in place, bettors will turn to those which are both regulation-compliant and with low fees. MEVU, through its implementation of blockchain technology and automatic payments via smart contracts, stands to be both of those things. With a few partnerships already under their belt and an exciting roadmap laid out into 2019, they’re certainly off to a great start. To learn more about MEVU and their token sale, visit their website. Stay up to date with news about MEVU’s ITO, new sponsorships, and upcoming events by checking out their Medium page or following them on Twitter. Where do I buy this token? I don’t see it listed anywhere or is it already dead?